As Neil and I get more and more into sourcing alternate avenues for food that distance us from the industrial agricultural machine, opportunities keep cropping up that we’d never have thought of. The latest: our very own hog! We’ve been looking around for some sources for purchasing an ethically-raised pig, but the local suppliers we’ve found so far have been somewhat reluctant to sell us a whole hog, wholesale. It’s understandable, since most of the local, ethically-raised pork product around here is in high demand, and what isn’t already claimed by restaurants can be sold at a much higher premium by the piece & pound than by the pig. We were a bit stuck, until one visit from my mother-in-law. She casually mentioned that with all the food-waste from the lodge they run, their compost pile was getting out of hand and wouldn’t it be nice to have a pig or two around to eat it, and then have some lovely pork afterward? She was concerned with the work it would take to make the pen, so we instantly volunteered to take care of it next time we visited, on the condition that we’d get a pig of our own out of the deal. She was sold, so the plans began. 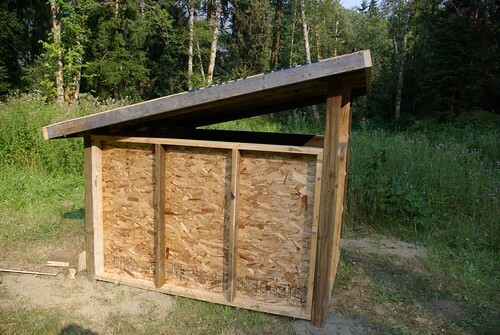 We also lucked out since they happened to have a whole bunch of spare wood around the lodge from some renos, so we were able to make the pigpen with $100 in new wood/concrete and the rest out of scraps. Had we been more ambitious with our salvaging, we might’ve been able to reduce that by another $10-$20 and building the walls entirely out of 1×6 rather than OSB. You can view the entire set of pen-pics on Flickr. It looks a bit like a bus-shelter on a patch of grass right now, but come Spring when we fence in the yard and add some hay, a trough and the piglets, hopefully it’ll look less forlorn and more farm-y. And if all goes well (and the bears don’t do them in first) we should have an amazing porky feast in September 2010! .-= ritchie´s last blog ..Gooooooo Lions! =-.